The pastor of St. Paul Parish in Sellersburg smiles often in the course of his daily ministries as a priest—smiles that are enhanced by the sparkle in his eyes, his frequent laughter and his delightful jokes. These days, the retired Air Force chaplain who achieved the rank of colonel is still shaking his head in amazement after Pope Benedict XVI named him a monsignor on April 11 for his distinguished service to God, the Church and the country. On Aug. 14, Father Richart and four other priests—one posthumously—were honored as monsignors by Bishop Christopher J. Coyne, auxiliary bishop and vicar general, during an Evening Prayer liturgy at SS. Peter and Paul Cathedral in Indianapolis. The ecclesiastical honor coincides with Msgr. Richart’s 50th anniversary of ordination to the priesthood by Archbishop Paul C. Schulte on May 7, 1961, at Saint Meinrad Archabbey Church in St. Meinrad. He often looks to his patron saint for inspiration in his priestly ministry. Looking back on his five decades of ministry, Msgr. Richart said he has enjoyed his life as a priest and 29 years of military service as an Air Force chaplain. The Seymour native, who grew up in St. Philip Neri Parish in Indianapolis, said he hasn’t thought too much about his retirement at an as yet undecided date. Instead, he simply tries to help make people’s lives better and bring them closer to God. His Christ-centered life as a Catholic priest has taken him all over the world in his military assignment as an Air Force chaplain. 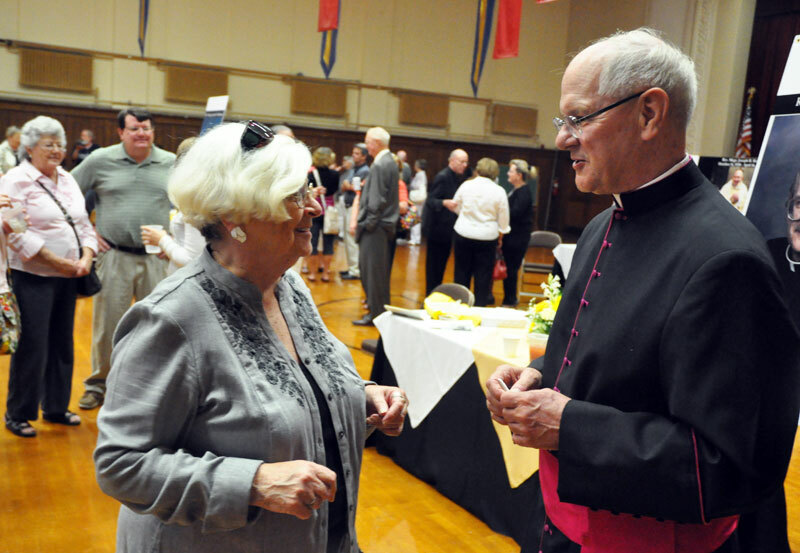 He will never forget the day that Archbishop Schulte summoned him to the chancery in 1967—during the Vietnam War—when he was serving as assistant pastor of St. Christopher Parish in Indianapolis. His first assignments took him to Air Force bases in Washington state and Greenland. Next, he served at the Air Force Academy’s Community Center, the parish at the academy, in Colorado Springs, Colo., where he also traveled with the football team as the Falcons’ chaplain. Following an assignment in Hawaii, where he also helped refugees from South Vietnam, he completed a master’s degree in religious education at The Catholic University of America in Washington, D.C.
That master’s degree helped prepare him for service on the Chaplains Resource Board in Alabama, which published religious education materials for enlisted men and women in the Army, Navy and Air Force. Later, as a command chaplain, he ministered to chaplains at Air Force bases across the U.S. as well as in Europe, Iraq and Somalia. During those years, he logged countless air miles flying around the globe. “I enjoyed serving in the military,” Msgr. Richart said, with people who focus on their love for God, country and family. His special mementos include an autographed racing helmet from Indianapolis Motor Speedway drivers from his time at St. Christopher Parish, a signed football from the Air Force Falcons, an ice axe used to cross glaciers in Greenland and folk art from the Philippines. He is glad that he has given his life in service to God and God’s people, which he said has truly been an adventure. Since he was named pastor of the New Albany Deanery parish in 1996, Msgr. Richart has enjoyed fishing with two priest friends—Father John Geis and Father William Ernst—as well as several St. Paul parishioners. Favorite Bible verse: “I have fought the good fight, I have finished the race, I have kept the faith” (2 Tm 4:7).